With a blog name like Dollar Store Crafts, how do you not already love them? If you haven't checked them out already - you really should. They have a plethora of amazing DIYs! They have a how-to video on their page - so check it out if you need more help! 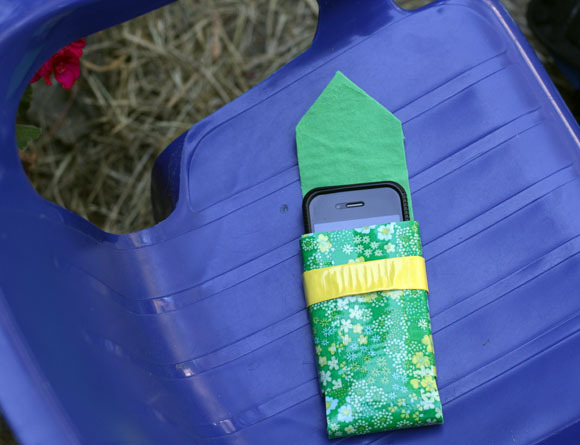 Make a sleek-looking duct tape case for your iPhone (or other smart phone) with duct tape. What makes this design special? 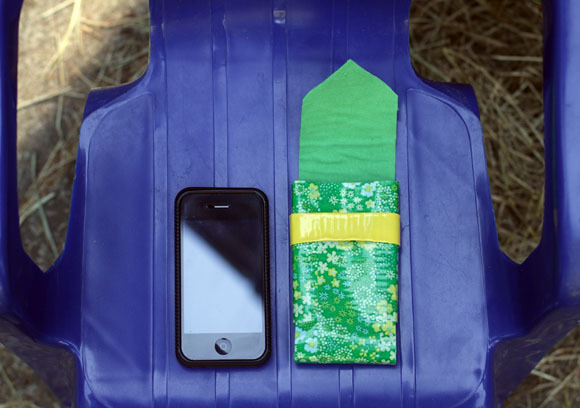 It's lined with fabric so your phone stays free from stickies and scratches. 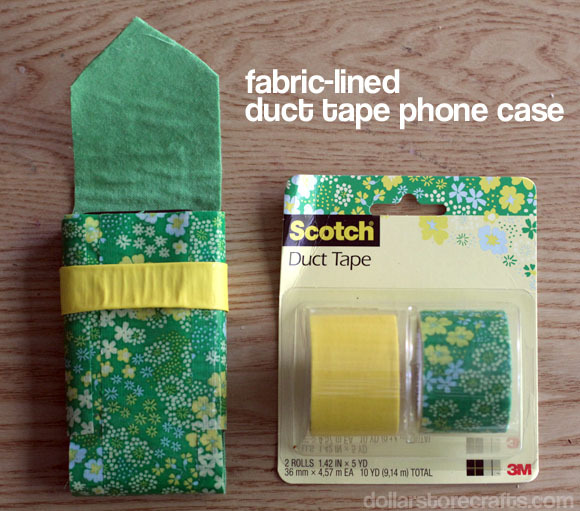 I have never seen another duct tape phone case that uses the technique I developed for creating a fabric lining, so grab a roll of duct tape and some scrap fabric and come make a phone case with me. You will just need to alter the measurements of the pattern pieces to fit your phone. A piece of fabric (I used flannel) - about 6x15"
Note about duct tape: I have seen it at the dollar store, but I have a huge weakness for colored and patterned duct tape, and that will run you slightly more per roll (although, it will probably be pretty comparable if you calculate the cost per foot -- the rolls at the dollar store are small). 1. 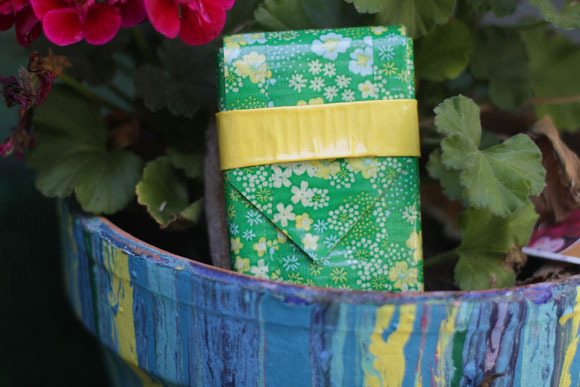 Cover your fabric with duct tape on one side, overlapping the duct tape at each strip's long edges. 2. 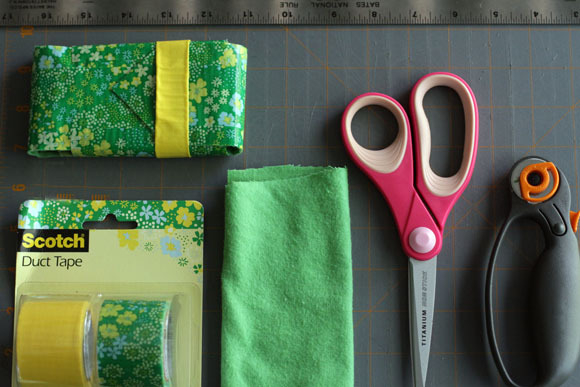 Trim off all the edges of the fabric piece, removing any excess duct tape. 3. Trim a piece of the duct tape fabric that measures about 14" long and 2.5" wide. Trim one edge to a point. 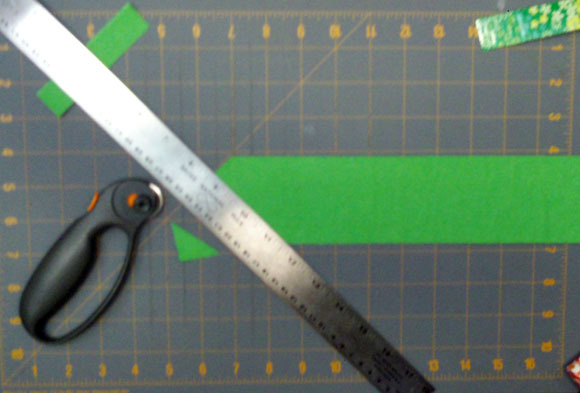 If you have a cutting mat with guide lines and ruler, you can measure the center point of the short side of the piece. With a washable marker, mark the center point of the side (should be 1.25" if you are using my measurements), and line that point up with the point of the X on your cutting mat. 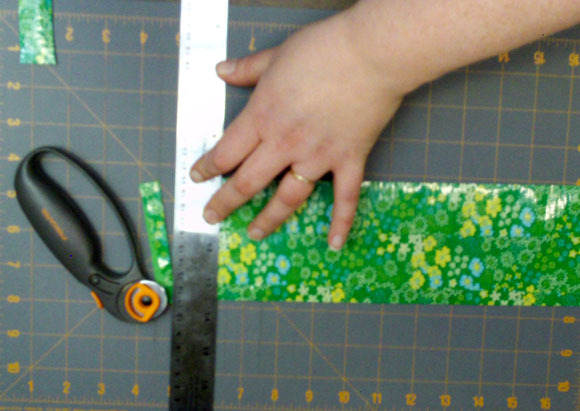 Line the ruler up with the X's lines, and trim a perfect mitered edge on your piece. Or you can just eyeball it. 3. 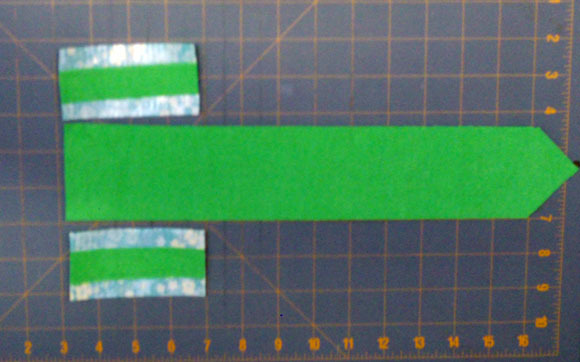 Cut two pieces of the duct tape fabric that measure about 3.75" long and .5" wide. These will be the sides of the case. 4. 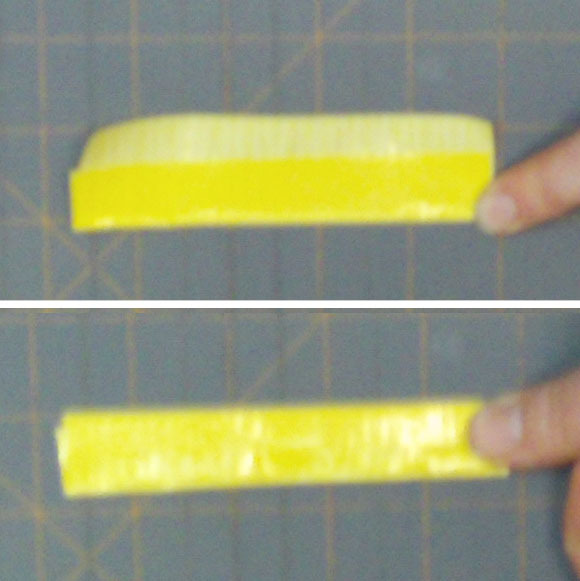 Put the two small pieces on the center of a piece of duct tape. 5. Attach the side pieces to the sides of the straight end of the main piece (should end up looking kind of like a T) -- these are your "wings." Tip: leave a microscopic space between the side pieces and the main piece when attaching. This will allow ample room for the sides to fold up. 6. Put your phone on the top of the T, and wrap the long end of the strap up and around the bottom of the phone. 7. 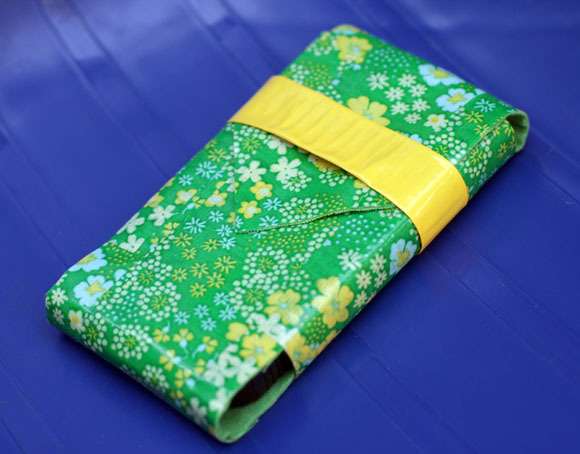 With your phone still inside the long strap, fold the wings up over the back side of the strap. 8. You should now have a pouch. All that's left to do now is add a strap to secure the front flap. 9. To create the strap: Cut a piece of duct tape about 5.5" long. 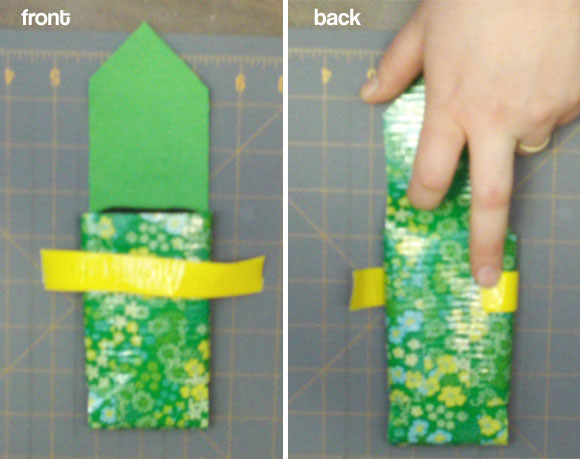 Fold it one-third up on the long end of the tape. Then fold down the top over the first fold. You should end up with a narrow, long strap. 10. Wrap the strap around the front of the case, not too tight. The backs of the strap should wrap around the back of the case. 11. Secure the back of the strap to the back of the case with duct tape. The easiest way is to put a piece of duct tape on each end of the strap, and fold it up (snug, but not too tight) and secure the duct tape to the back of the case. 12. You're done. The front flap should slide easily in and out under the strap. Your phone should slide easily in and out of the case, but be pretty snug and secure inside.